Senate Bill 1001, endorsed by the U.S. Forest Service and the Idaho Recreation Council, would require OHV riders under the age of 16 to take mandatory safety education classes. The bill advanced out of the Senate Transportation Committee last week, and it appears headed for a vote on the Senate floor in the coming week. Sen. John McGee, R-Caldwell, the majority caucus chairman, is the bill sponsor. If passed, state officials estimate that about 4,000 - 4,500 Idaho youths might take OHV safety classes per year, compared to fewer than 100 per year who do it on a voluntary basis. The bill does not include any funding for the new work load, so right now, how the classes would be funded is an open question. · Youth training will emphasize responsible use of OHVs and will reduce irresponsible activities and associated impacts. · When youth are trained, they will be able to communicate responsible use messages to adults and parents. · Adoption of a training requirement will reduce the concerns of many Forest Service officials and will reduce the need to close Forest Service roads to OHV use. · Training on road signing and other on-road issues will make young riders safer. · Training will not be required for youths who just use trails (not USFS main access roads), thereby reducing the impact of the mandate. The legislation was brought by the Forest Service and the Idaho Recreation Council to address safety concerns on main access roads with a high volume of traffic. 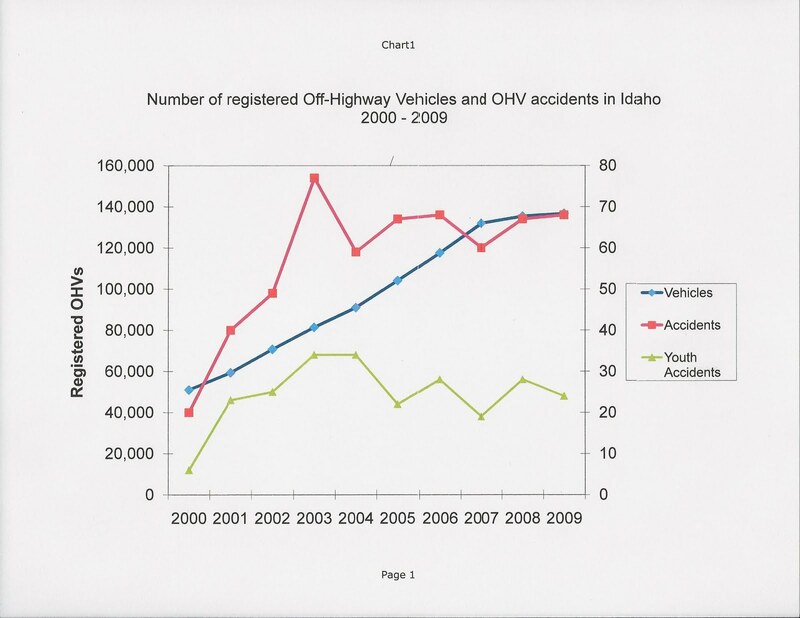 In 2009, the Idaho Legislature passed a law that allows youths to ride on USFS main access roads without a driver's license as long as they are under the supervision of an adult. Even with adult supervision, Forest Service officials are concerned about youths operating OHVs on main access roads because kids wouldn't have the same training as a licensed driver. Youths could get in an accident with a speeding vehicle on curvy roads with poor visibility. Here's a video that explains the risk during hunting season. Statewide, since 2001, there have been about 20 accidents involving kids on OHVs each year on public roads, according to ITD records. In 2003 and 2004, there were 34 accidents in each of those years. It's unclear how many of those accidents occurred on Forest Service roads or elsewhere. 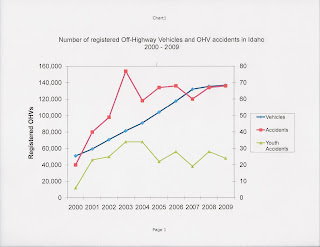 "We raised our questions about this law two years ago due to concerns about safety -- safety for the OHV operator as well as that for the driver of highway-legal vehicles like a car or truck," said Andy Brunelle, USFS liaison in Boise. While the legislation is moving through the Idaho Statehouse, the Forest Service is reviewing the safety of its main access roads in all of Idaho's national forests, as was mentioned in a previous blog. The safety review involves 2,700 miles of forest roads. If the new legislation passes, Brunelle said, the Forest Service's safety concerns would be reduced because of the compulsory OHV education for kids. Young OHV riders would learn about the potential dangers in safety courses, and would be better equipped to ride in mixed-use areas with heavy traffic. This is one reason why the Idaho Recreation Council supports the bill, officials say. With the legislation, the pressure to restrict USFS main access roads will be reduced. The Forest Service still is likely to take steps to make the main access roads as safe as possible with signage, brushing-cutting to improve visibility and other measures, Brunelle said. The Idaho Farm Bureau is opposing S 1001 because it opposes mandatory OHV safety classes, according to its legislative update "Capitol Reflections." Farm Bureau officials say the classes should be voluntary. If have an opinion about SB 1001, contact your local legislators. If the bill passes on the Senate floor, it would move to the House Transportation Committee. If it passes that committee, it would advance to the Idaho House of Representatives and then Gov. Otter. You can keep close tabs on the Idaho Recreation Council's web site to see what action they recommend in the days and weeks ahead. We'll let you know how things turn out. Very Good Bill S1001, Our youth get better training before being put on an ATV, making everyone's recreation experience while on Forest Service Roadways a good one. I vote yes for S-1001 and so should you.